Phacelia will survive mild frosts to overwinter and bloom in spring. Cucumber, Tomato, Kale and Broccoli. Sow in late summer or early autumn as a green manure. Make sure seed is well covered, because phacelia seeds need darkness to germinate. Phacelia is a wonderful plant for attracting bees and other beneficial insects, particularly useful in early spring if it has overwintered as it is an early pollen source for bees coming out of hibernation. For maximum benefit as a green manure dig in when quite small. Otherwise leave plants to grow up to 1m (3 ft) tall as the flowers attract beneficial insects. 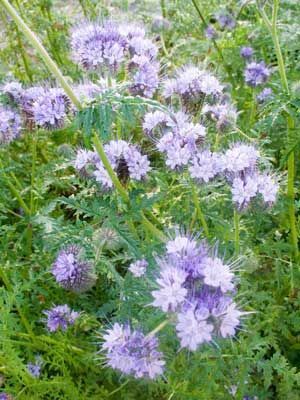 Although native to California in the US phacelia harbours damaging lygus bugs, so it is rarely grown there.